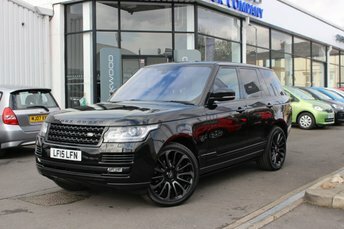 This stunning example of the Range Rover Sport is fitted with heated leather seats in the front and rear with electric seat memory in the front, an Open Sky Panoramic Sunroof, Digital TV reception with rear media screens, a heated multi function steering Wheel with paddle shifters, Parking Sensors at the front and rear with a reverse camera and a Meridian Sounds System. Also featured on this Range Rover are automatic side steps for vehicle entry, an electric retractable Tow Bar, 21in 9 Spoke Alloy Wheels finished in black, Cruise Control with a speed limiter and Satellite Navigation. This car has been well loved and kept in lovely condition. Large and powerful, the Range Rover sets the standard when it comes to refined 4x4 vehicles. The model's distinctive silhouette and bold contours will turn heads everywhere, while inside the cabin driver and passengers are treated to a refined and beautifully appointed interior. Spacious and versatile, the Range Rover comes exceptionally well equipped. Come and discover one of our quality used Range Rover models for sale in Bury today. At Oakwood Motor Company Ltd you can rest assured you'll only find the highest quality second-hand vehicles, all of which are rigorously tested prior to arriving on our forecourt. View the latest stock online and be sure to contact a member of the team with any questions.